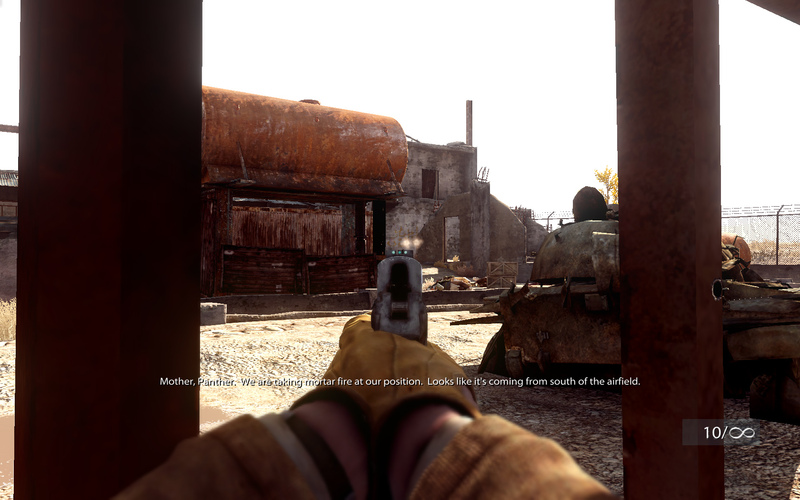 The genre follows standard first person action procedures, but unfortunately, it appears to be using the standard from years back. By this, the game is heavily, in fact 100%, linear and most actions of the game are scripted in precisely. A wandering soul will find many invisible walls, and worse, invisible gunfire. If I tried to progress too far I would be gunned down nearly instantly, even if the enemies were not in sight and I was behind a barrier. Not to stop at gentle guidance, sometimes the scripting would fail (Horrible in a solidly scripted experience), allowing progress far beyond the commentary of allies, or failing to work at all. One instance I was supposed to hide and use stealth, but I was constantly being detected despite many reloads and efforts to follow my ally's instructions exactly. 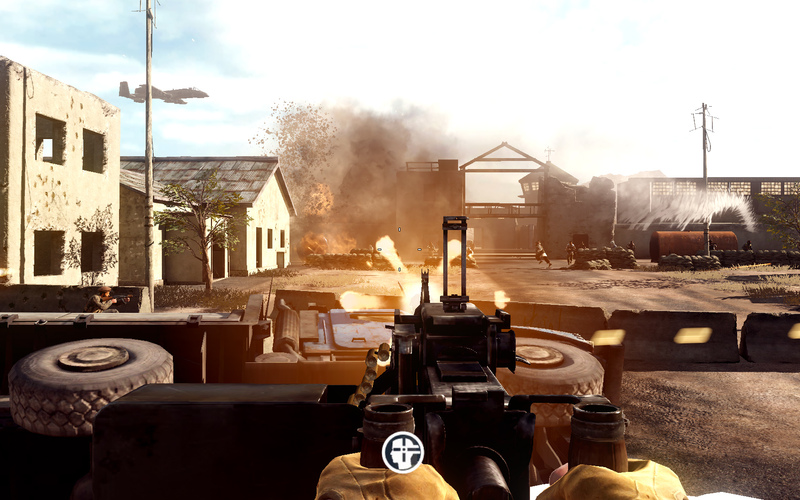 The game pulls a Call of Duty approach to the narrative, switching between combatants in the war. I must say that the transitions between characters were very smooth, and unlike Call of Duty, do not constantly fly up to an overhead map between each plot line. 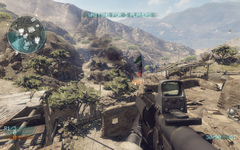 One transition pops the player from a squad under fire, to the sniper covering them in the hilltops. 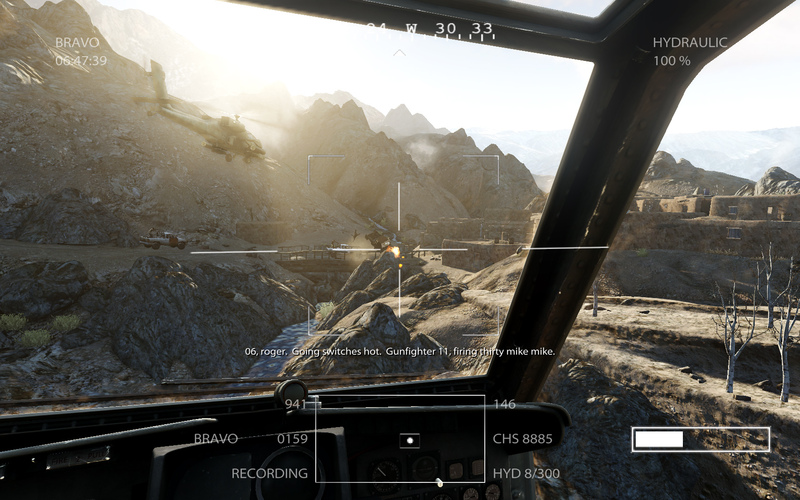 The various stories are all interlinked, and while some let you escape ground combat by AC-130 bombing, or helicopter runs, all were quite shallow. For a game with realism in its advertising, I was hoping for paralyzing moral struggles and heavy character development. How about a heavily populated village where you have to avoid collateral damage? How about the hesitation of shooting young teenage soldiers? I only recall about one situation in the story that bothered to approach something other than tension, and it was a polemic to unknowingly bomb some allies. All the other time it was about senseless killing. Perhaps I was supposed to pepper the game with my own morals, being a United States citizen and knowing of the atrocities committed to my home nation, but since the game is linear to a T, I can't even decide to go AWOL or sacrifice a squad member to save another. Worse still, you don't even have to follow the orders of your commanders. While the dialogue may go through the process of getting clearance to fire, you can go ahead and kill people regardless. Nobody debunks you for jumping the gun, which I felt just removes more from the military discipline that game is trying to craft. Even it comes to describing the parts the player has control over, it too is lacking. I wouldn't choose this game for its single-player shootouts, for which did not depend on skill or technique to surpass. You either just kill all the enemies, or you kill the "special" scripted danger enemies to advance the scene. There are no tactics, and the enemies will either pop endlessly behind rocks, or rush blindly towards their scripted positions. It was times I was out of control of the characters that the game was told best. Had this have been a movie, it may have gotten superior reviews from me, but instead the lulls of the firefights actually cut out the excitement of the cinematic. Having to be revived is a punishment and not a learning experience, one mode space between the next cutscene and me. At least when death does come Medal of Honor has a very short loading time upon first load and reload after death. Why can't more games work this way? My favorite of the non-interactive sequences would have to be near the game's end. A helicopter comes under fire and all the garrisoned troopers were thrown like they were in a child's Popper Push Toy. This was real. This was something I felt was rarely told and I wanted to experience more. The game's ending was also quite refreshing with a somber attitude and cinematography. Just following it was an exigent final text too forceful for the game it followed. To wash the flavor of the gunplay out of my mouth, let's talk graphics and sound. The guns and sounds are great. Pow Pow! "Enemy down!" you hear from a nearby squad member, reacting to your combat, while explosions ring out. As you return fire with your rifle, the sounds differ from scoped and no-scoped situations. Voices are of high quality and acting but the effect of the character speaking both next to you and though the mic is jarring. Who is speaking to me? Still, there are many speaking lines as your fellow soldiers chatter, shout out targets and orders. If you are taking heavy fire, they will warn you to take cover. There is a lot of military lingo going on, which helps set up the setting, and is well done overall. Accompanying all these moments are a soundtrack or ambience that is suitable for the situation but will occasionally become too noticeable outside the cutscenes. Graphics should be better considering the linear-ness and not having to provide a large battleground to render. Some trees are 2D, and not in the sense of being far off and unnoticeable. Rocks and scenery are there for cover and not decoration. Some cover is destroyable under fire, a nice touch, but the specificity ruins the advantage of just hounding fire on a position to flush an enemy out. When it comes to those cowering behind the rocks, we find that the character models look detailed, especially the beard rendering on the soldiers. Following those stone runners as they flee, when you fire on an enemy they have a very clean transition to flinch animation whether they are running, standing or couching. Medal of Honor did this one thing better than others. When I shoot enemies, I should not know if they are dead or not immediately. I should treat the enemy as though they are still alive. Soldiers would fall over and then gradually rise to their feet again to fight back. With lead now scratching bone, they limped, wounded and slow. Disappointingly, the game opts to have soldiers "Goldeneye" their weapons, dropping them to the ground when they die. Had the player needed to rip them from the foe's dead hands, this caution of survival would have been greater. Who should play Medal of Honor? Those who enjoyed the senseless shooter. The game that leads them from point A to point B with interesting snippets of uncontrollable visuals to mix it up. If you don't want a thinking game, then Medal of Honor is for you. For some this is fine. Take a couple hours to relax and just shoot up some enemies, get the anger out. May I recommend spamming the knife button as many times as possible? Its rapid stabsure fit my pallet. If you do want something more deep, perhaps Multiplayer is the answer. Initially I hated the multiplayer. Just hated it. I died a lot, and it didn't seem believe it could be fun at all. 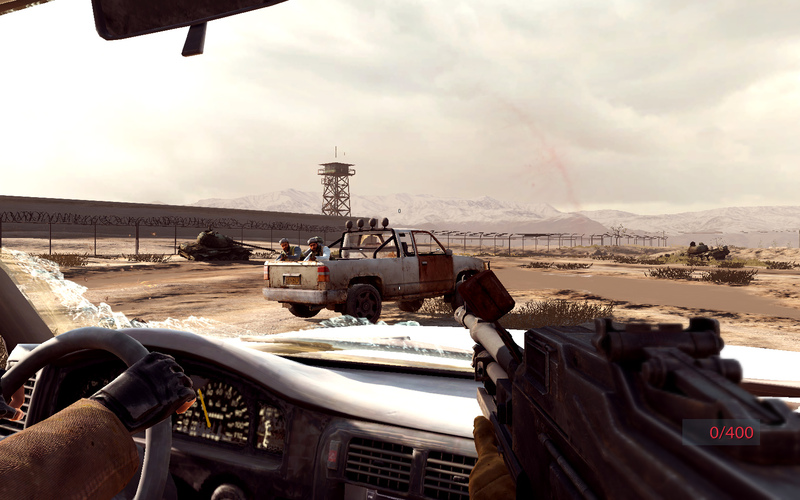 Comparatively, it reminded me much of Counter Strike, which is not a fan favorite for me. I persevered and here's what I found: You have to slow down. Call of Duty has success with running around and having confrontational battles from 2 ft away from the person. 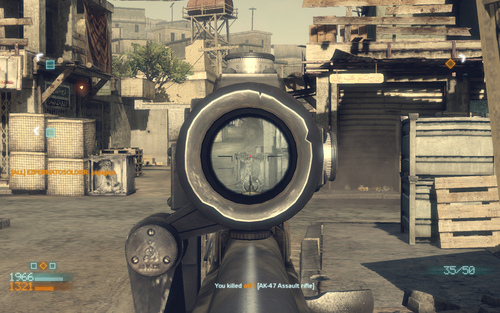 Medal of Honor is about the long range, the covering from point to point as you move and go in for the kill. Take, for example, the assault class. It is provided with a smoke grenade. Now smoke grenades are very under-utilized in shooters, but in Medal of Honor, it is a powerful asset. Why? Because there is no reaction time for dodging. Pop in the enemy's iron sight and pop, you are dead. Due to bullets still flying, so might be the enemy. The trick then is to engage from proper angles and cover. Throw a smoke grenade, run to new cover and engage and unknowing antagonists from afar. Doing this correctly feels quite rewarding, as you were able to outwit the human enemy. Nevertheless, this is also what Medal of Honor gets wrong. The maps are too cramped, so maneuvering around the enemy is very limited. The game also throws too many enemies on the map. The best games are those that have fewer than 24 players, and are on maps with lots of cover to move between. Also, teamwork, which would seem vital to this type of game, appears non-existent. Your friends would run out to die and then so would the next guy since you can't easily warn them of the dangers ahead. The game also commits another misstep by flipping spawns on deathmatch maps, but makes timing predictable. The enemy spawns on the side opposite the majority of the team. This does two things. First, it allows teammates and enemies to spawn camp as long as the rest of the team is elsewhere. Additionally, it spawns enemies behind your team as you advance into enemy territory. You might think you have cleared an area only to be shot in the back. If there were rounds where the spawns changed sides only once, or completely random spawns, these problems would have been better. 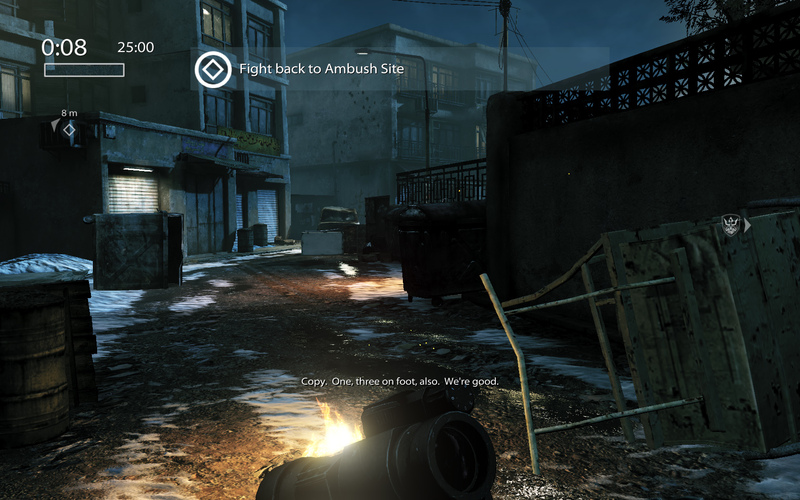 There is also a (1/3) fun Combat Mission mode where one team has to defend an objective, and the other tries to destroy or capture it. What makes this mode great is the rush to plant the bombs uninterrupted after a successful assault or the rush to wipe people off the point ASAP. The level of death and ease of killing fits better with the maps in this mode. Sadly, all but Airfield Assault are horribly cramped and camp-havens, making them not quite rated for fun. Even with the good map, these attack-defense games are not suitable for low tallies of players due to the ticket counter not adjusting for player count. The large tickets available for just a few attackers give them a better chance of pulling off their objective than the meat-grinder of an entire army faltering. With all that advice, find yourself a nice control-point game with about 12 players total and you should have a great time leveling up the three distinct classes. Both Assault and Special Ops are similar with varying side weaponry that makes them good for situations like crowd control or anti-tank. Sniper is the most diverse, but also probably the hardest, except on large maps where it is unnaturally cheap. Racking up a set amount of points yields a bonus power, either team-based or offensively oriented. The team-actions are very subtle, with flak jackets seemingly adding nothing, and match ammo taking the enemy out with perhaps one fewer bullet. Offensive actions allow the calling down of mortar strikes and missiles on specific positions. All of these powers while devastating if used correctly don't really change the flow due to the game's short respawn timer. Graphically, the multiplayer segment seems stronger than the single-player offerings. 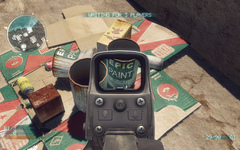 This may be due to the multiplayer using a different graphics engine, though I'd imagine the assets should be the same. The landscape appears more detailed, with littered debris around and objects to interact with. Also, noting the graphics being dull colors, it is surprisingly easy to identify foe from team-mate, which is mandatory for this game, where twitch action does matter. Multiplayer has more life to it. 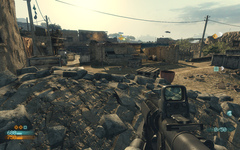 There are levels to advance, allowing more weaponry choices, and an alternative skin for high-level players. Level and weapons largely make little impact, and your success in the multiplayer will depend on how well you can react to forces, and pick them out of the environment. If you are looking for a counter-strike experience with different game-types and setting Medal of Honor may be what you are looking for. The Medal of Honor is a very interesting game. I likes Medal of Honor game series. I played many version of Medal of Honor.